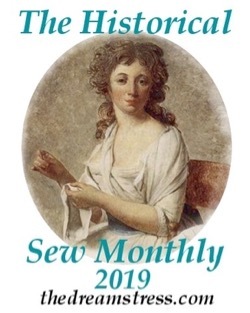 There are dozens of gorgeous historical items to be inspired by for the HSF ‘Eastern Influence’ challenge, it’s cold, and I’m feeling slow,and the only things that are inspiring me are warm and wooly. 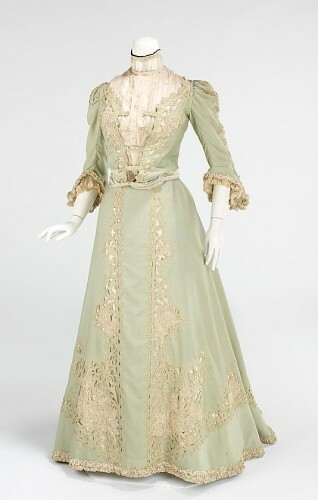 How about an early 20th century wool suit/frock with chinoiserie influences? Problem: there is only 2.5 metres. 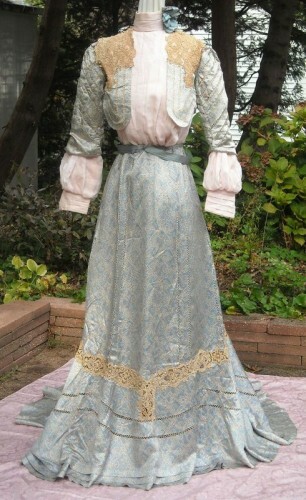 Not a lot for an early 20th century ensemble. Hmmmm….what if I picked a design that incorporated lots of appliqué and open space, and used that to stretch my wool? 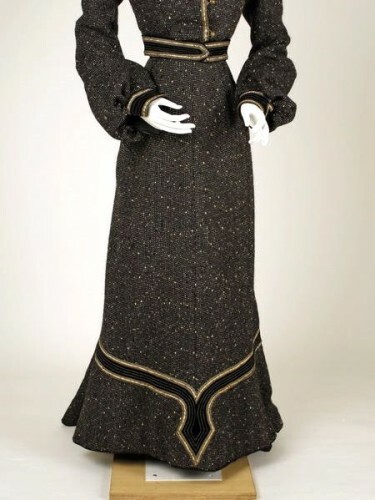 Turn of the century silhouette, wool, a teeny bit of a train (that wool just needs a train, 2.5 metres or not! 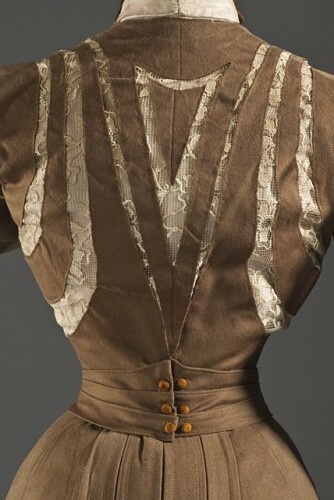 ), and an intriguing use of positive and negative fabrics in the bodice. And the Eastern Influence? Where is that coming from? 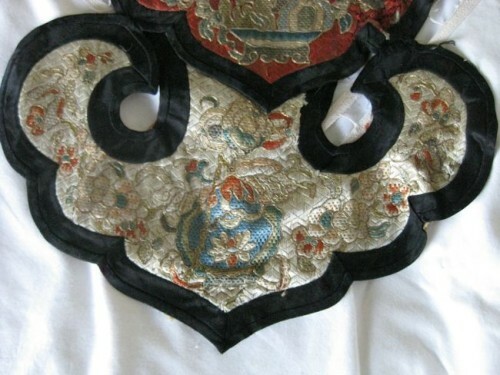 These cloud collars were worn for special occasions, particularly weddings. 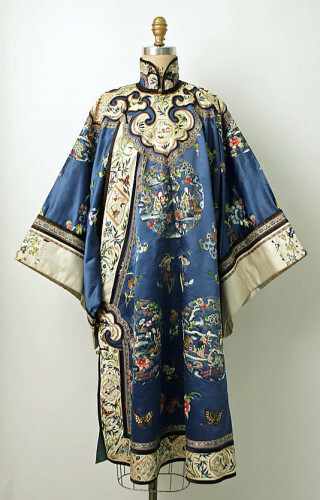 I’m going to use the basic ‘cloud’ shape as a repetitive motif in my garment, to create a distinctly Chinese aesthetic to a classically Western dress. 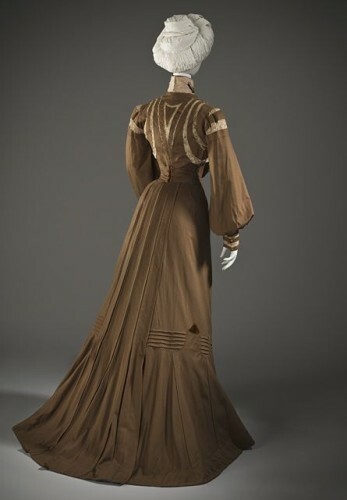 It won’t be based off of an actual historical example, but based on the Halleé frock, and the popularity of Chinese textiles in early 20th century America and Europe, it’s certainly plausible. (I know! 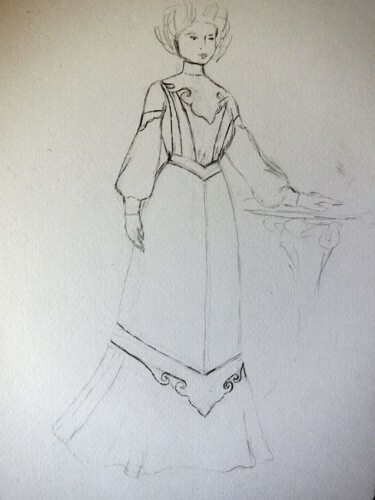 How long has it been since I’ve taken the time to do a proper costume sketch?). I still need to colourise it, but basically the skirt will be blue wool excepting the appliquéd border, the upper sleeves will be blue wool, with borders of black satin and lower portions of black silk or black wool gauze (or a white or cream fabric? 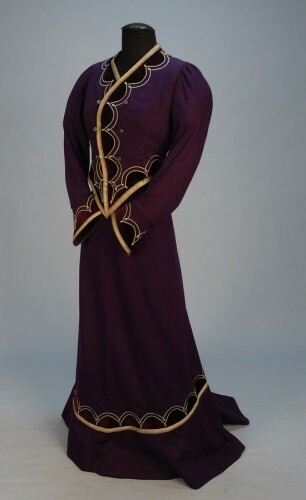 ), the ‘cloud collar’ will be black satin, and the strips coming down on the bodice will be blue wool, framing areas of black silk or wool gauze, with a black satin belt. Probably. We’ll see what happens when I cut and drape! So, big plans – I just hope I can get them done! First up: a skirt, and a trip to the Asia Gallery, in hopes that they have another black silk obi, because I used the last one on my Midnight Garden corset. I do love the Qipao very much….and part of this extends to the embroidery as well as silk pipings…so I do know what you mean! Wishing you every good luck with your new project and I shall be excited to see the finished product! Oh, that looks good! 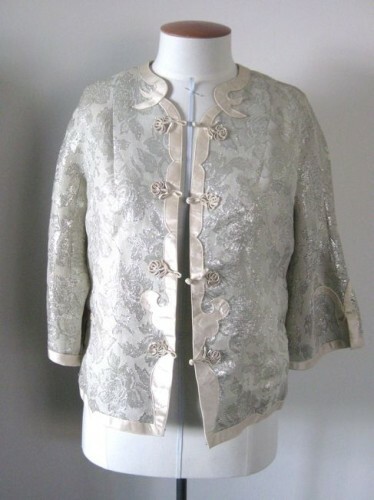 I’m rather sorry you scrapped the bolero idea – boleros are fun, and it would save you fabric – but this looks pretty. And I vote for light colours. Aside from my usual love for blue and white, I think the pattern will pop more against a light-coloured backdrop – like your own photo of the cloud collar. And it’s usually a light colour in the extant garments of this kind, as far as I can tell. And yes, very good of LACMA. 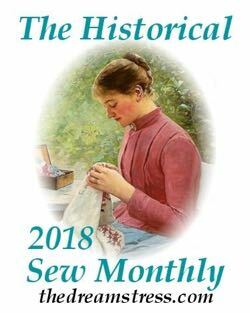 Reminds me of how I desperately tried to figure out what fabric that blue 1848 kacabajka was… I will be curious to see how you do your trim, because I want to do something similar (though much, much simpler) on the jacket. I’m debating the white. 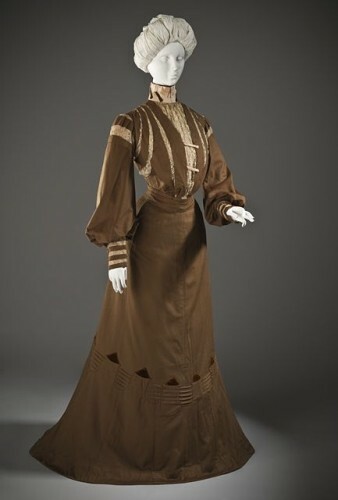 I rather like the idea of the whole ensemble being wuite dark, like the Halleé dress. Dark colours are more common for woollen garments at the turn of the century too. But blue and black and white would pop beautifully. Maybe it’s my western eyes, but light blue and black seem so off to me. In fact, wasn’t there a rate the dress with a similar color combination? Now I love love love light colored wool. Especially come the end of January and February where we all could use a little lightening up in the cold! The idea sounds lovely to me. I look forward to your progress reports. 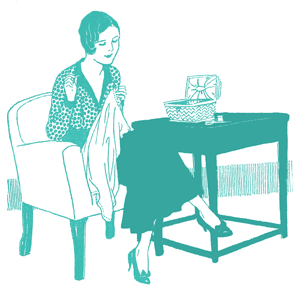 It all sounds very promising – this will be such an elegant garment! The cloud collar looks very ‘right’. Love the wool, and black sleeves etc will work so well. Much happy anticipation! Wow, this is going to look amazing! What lovely designs and sketches. Have you considered using peach with that blue? Black & white seems to go against the chinese elements. I’m not much of a fan of peach and blue, and black, white and blue are a very traditional Chinese colour scheme. 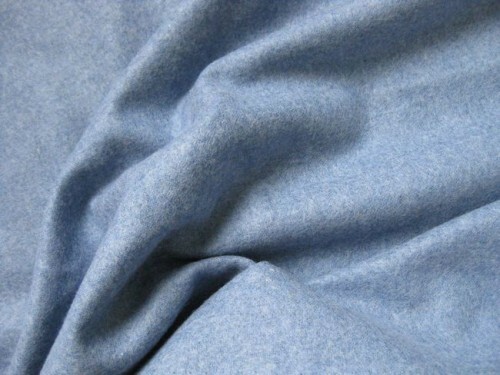 In China dark blue was one of the most popular colours for clothing: the indigo-dyed blue as practical and ubiquitous denim blue jeans are today. 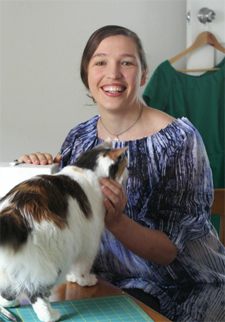 Peasants wore it in simple cotton garments, the upper classes in silk. 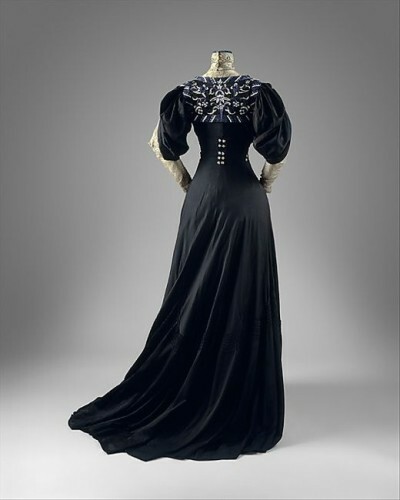 Combined with black and white, dark blue would be worn by older women, particularly for mourning, but in the West it would invoke references to blue and white porcelain, and the addition of the increasingly chic and fashionable black (the black dress was popular long before Chanel), would create a sophisticated and exotic effect. Plus, this is intended as a winter ensemble, and peach just wouldn’t do period-wise. I was hoping that you would go back and talk about the color scheme! Thanks for the explanation of the whys.